(Nanowerk News) Rifat Emrah Ozel recently presented his nanoparticle research on an international stage. OzelOzel, a Clarkson chemistry Ph.D. student, attended the Sustainable Nanotechnology conference in Santa Barbara, Calif., in November. The conference attracted experts in sustainable technology from around the United States and the world. Ozel received a $500 graduate student award at the event. Rifat Emrah Ozel, a Clarkson chemistry Ph.D. student, attended the Sustainable Nanotechnology conference in Santa Barbara, Calif., in November. "It was really interesting to see what scientists were doing in the area of sustainable nanotechnology, to exchange ideas and to build new scientific collaborations for the future," Ozel said. Ozel presented the research that he is in the process of completing with Clarkson professors Silvana Andreescu and Kenneth Wallace thanks to a three-year, $305,000 grant from the National Science Foundation. The research team is studying the long-term effects nanoparticles have on human health and the environment. "Our technology is unique in that no one else is using microelectrodes to study physiological effects of nanoparticles at organ level in living organisms," Ozel said. "It was a great opportunity to meet with leading experts in the field and let them know that Clarkson is doing this type of work." The team will develop methodology to determine the concentration of free radicals within an organism resulting from nanoparticle exposure. Free radicals can damage cell membranes, proteins and DNA of affected cells resulting in inflammation and long-term health problems. 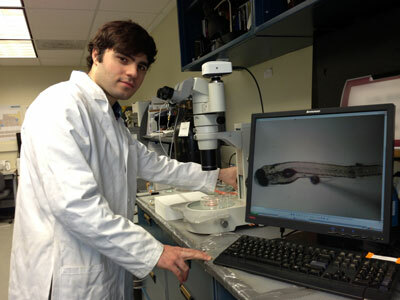 The Clarkson researchers are using zebrafish to assess toxic reactions that would occur with human nanoparticle exposure. Zebrafish are an excellent model system because they have a digestive tract that is similar in structure and function to the human system, but have a rapid development time and develop externally for easier viewing. Zebrafish embryos will be exposed to a variety of metal and metal oxide nanoparticles with varying levels of toxicity. Concentrations of free radicals within the digestive system will be determined with microelectrochemical probes developed during the study. The project will create a new framework to assess nanotoxicity and provide a clearer picture of the relationship between nanoparticle exposure and human health. It may also help develop guidelines to modify nanoparticles and their use in the future.